About 2000 BC, Assur became independent of the collapsing 3rd Dynasty of Ur. Then the Assyrians became well-known traders. They travelled constantly between Assur and what is now southern Turkey with their donkeys. 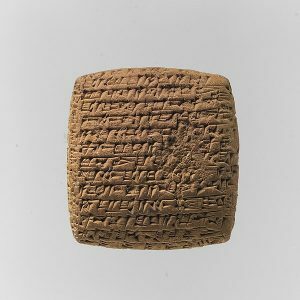 A cuneiform letter from one Assyrian cloth trader to another. They lived well, with big houses and many employees. In Assur, Assyrian women spun, dyed, and wove wool and linen cloth for their husbands or brothers to sell. Assyrian women ran large businesses in Assur while the men travelled. Assyrian traders carried this cloth from Assur on their donkeys. They also brought tin from beyond the Tigris in Iran. The men traded their cloth and tin in southern Turkey for gold, silver, and other metals. But as the Hittites took over that area around 1800 BC, this trade gradually collapsed. The last Assyrian caravan to the Hittite territory was ca. 1780 BC. By 1700 BC Amorites conquered the Assyrians. Later the Hurrians ruled the Assyrians for a long time. But then the Hurrian kingdom collapsed about 1360 BC. The Assyrian governor of Assur, whose name was Assur-uballit, saw his chance and began calling himself the King of Assyria. 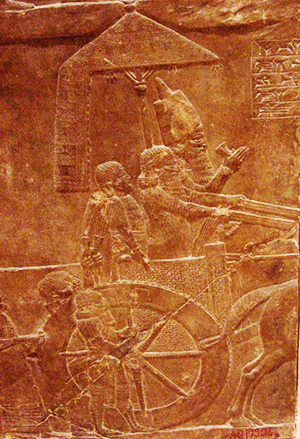 Assur-uballit and the Assyrians soon had to fight both the Hurrians and the Kassites in order to stay independent. But they won their wars and were able to establish themselves. They made a lot of alliances with the Kassites to their south. Many Assyrian princesses married Kassite princes and the other way around. 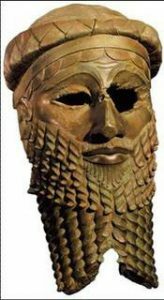 Under their king Tukulti-Ninurta I (known in the book of Genesis as Nimrod), about 1225 BC, the Assyrians conquered the Kassites and the city of Babylon, capturing the great statue of the god Marduk there and bringing it back to Assur. But people objected to this sacrilege, and the conquest of Babylon. A mob led by his son burned Tukulti-Ninurta to death by setting fire to his palace. The people freed the Kassites again. A Dark Age overtook West Asia about this time, with the invasions of the Sea Peoples and a lot of movement among the Hittites, the Hurrians, and the Jews, and the gradual collapse of the Kassites as a result. The Assyrians were the only big kingdom in West Asia not to collapse as a result of the Dark Ages, and so they were in a good position to take over afterward. By 1115 BC, under their king Tiglath-pileser I, they were able to expand south into Babylonia again (being more careful to respect the ancient gods there this time), and west. At first, these were basically plundering expeditions. The Assyrian army, which was feared everywhere, started out pretty much every spring going south along the Tigris river. Then the army would cross to the Euphrates and follow that upstream until it got home again to Assur, around the end of the summer. Along the way the soldiers collected whatever they liked: cloth, gold, pearls, artwork, or slaves. Assyrian inscriptions call this “tribute”, but people either gave it in order to keep from being attacked, or the Assyrian soldiers attacked them and took it anyway. These plundering expeditions continued more or less every year for hundreds of years, down to Assurnasirpal’s reign in the 800s BC. Assurnasirpal’s son Shalmaneser III decided to expand the Assyrian empire even more. He took the plundering expeditions even further west, where he first met the Jewish kingdoms of Israel and Judah. At first the Jews resisted Shalmaneser successfully, but by the 830s Shalmaneser seems to have placed pro-Assyrian Jews on the thrones of both kingdoms. We guess that he collected tribute as well. Cite this page: Carr, K.E. 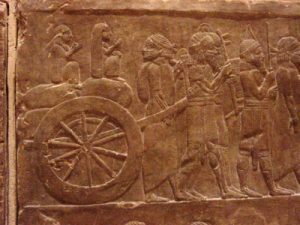 Assyrians – Mesopotamia – West Asian history. Quatr.us Study Guides, September 13, 2017. Web. April 22, 2019.